Two roads diverged in a wood… and your child is lost! Hiking and camping season is upon us. Families are hitting the trails to enjoy nature and all its benefits. Nature is neither for you or against you. Nature is neutral. But Mother Nature can also be brutal. Any survival instructor that says otherwise is delusional. Over the past two years, my 9 year-old grandson and I have spent time together learning survival and self-reliance skills. When he visits now, he usually asks if we can build a fire. The thermometer reading in Georgia matters not, he wants to burn stuff. Leadership equals influence. Influencing your child to get outside is often easier achieved by you Doing the Stuff. Share your knowledge, demonstrate the skills, and let your child imitate the skills until they become proficient. If your child knows nothing else about survival, the following will keep him alive if ever lost in the backcountry. What is survival? It may be easier defined by stating what survival is not. Survival isn’t wilderness living, camping, foraging, or bushcraft. Your child won’t have to carve a spoon, make a survival bow, know 21 edible plants, or build an elaborate shelter to stay alive in the unfortunate event he is ever lost in the woods. It’s highly probable that search and rescue will find him before the weekend is over. Survival is any situation where if you don’t take corrective action, you die. Shelter – Hydration – Sleep until rescued. Clothing: The most important piece of the survival puzzle is having the ability to build a microclimate for core temperature control. The first layer of shelter is the clothing your child wears. Dress appropriately for the weather and location. Cotton is a killer in cold weather survival due to its ability to hold moisture against the body. However, it can be a lifesaver in hot weather by exploiting this same property for evaporative cooling. Tarp/Cover: Beside clothing, go out prepared to use every shelter option available in your kit. A reusable mylar space blanket is my #1 option to build an emergency microclimate. Add a clear 9 x 12 inch plastic painter’s tarp and you have a lightweight, effective cold weather microclimate called the Kochanski Super Shelter. You’ll need to teach your child to collect enough wood to build a fire in front of this shelter for it to be effective through the night. Insulation Layer: A closed-cell foam ground pad is what I carry when backpacking or camping. This piece of gear offers a barrier from cold ground (conduction) or helps prevent heat loss from convection when laid in the bottom of my hammock. From my experience of hanging and ground camping in a sleeping bag, this insulation layer is essential to creating a microclimate. Without a commercial ground pad, two contractor trash bags can be used as an insulation layer. Fill both bags with leaves or fluffy stuff so that, when compressed, you have a 4 to 6 inch barrier of insulation. In a pinch, the forest litter filled bags can be used as a makeshift sleeping bag. There are multiple survival uses for plastic bags. Two bags won’t add much weight but multiply your survival chances. Fire: The main reason I teach fire craft to my 9 year-old grandson is to reinforce its forgiving nature as a survival tool. Yes, even with no other shelter options, fire can keep you alive. We have many articles parked on our Bombproof Fire Craft Page. Find and drink enough water to cause urine to be clear. Remember, even if you don’t have a way to disinfect your water, drink it anyway. You want to die from dehydration or have the trots a week later after being rescued hydrated and logical in the wilderness? The above statement may seem counter to “proper” survival advice. But if you’re not prepared with water treatment gear, drink the water to stay alive. Food should not be a concern for short-term survival. If you have enough calories to consume daily, eat up. Otherwise, fasting is your best choice. Physiologically, our bodies can go several weeks without food with no ill effects. Be prepared with water disinfection equipment. My preferred method of water disinfection is boiling. You’ll need a metal container and fire. Fire plays such an important role in survival. Without a suitable metal container, use your garbage bag to boil water using the stone boil method. Practice fire craft! I also like the lightweight Sawyer Mini filters. More detailed information on water treatment can be found here. Plants and trees are also a source of water and need no filtration. Cut a wild grapevine and water will drip into a container. A clear plastic trash bag can be used to get water from leafy, low-hanging tree branches through transpiration. John McCann has a great article on using this method. When camping, I call sleep the number one skill of a good woodsman. But in a true wilderness survival situation, restorative sleep is key to staying alive. If you’re child has learned to build a proper microclimate and learned at least two methods of disinfecting drinking water, then sleeping 8 hours is his next survival skill. Scared and alone in the wilderness, I always go back to fire. Beside being a great survival tool for shelter and water disinfection, a fire offers phycological comfort. Kind of like a nightlight in the woods. It not only keeps the boogieman at bay, but gives some peace of mind concerning predators. Your child should sleep at opportune times. Not all eight hours have to be consecutive like we stress when home. An hour here and there adds up. With sufficient sleep, your child will be better prepared to deal with the stress of survival. Our physiological body needs sleep for rational thought and decision-making. Sleep deprived, we make stupid mistakes. Use every available resource to make a comfortable microclimate for sleeping and shelter from the elements. From the biblical perspective, sin is “missing the mark.” In wilderness survival, not hitting your target in one skill doesn’t have to mean certain death. However, fall short in these three critical survival skills, and, dude, you’re screwed! You may not get a second chance to see your family again if you can’t stay warm and hydrated. Having the ability to regulate body temperature brings redemption. Your body does a remarkable job regulating core temperature. However, add moisture to the equation, drop the temperature slightly, and you’ve got a perfect storm for hypothermia. Water saps body heat 25 times faster than air. And 70 to 80% of your body heat is lost through your head and neck. The remaining heat loss goes through your fingers, hands, and feet. The simple act of breathing in cold air and expelling warm air will chill your body. A slight change in core temp, even by a degree or two, will affect your bodily functions. Shivering, lack of coordination, slurred speech, and numbness in the extremities are signs of hypothermia. Decrease to 91.4ºF (33ºC) and you lose consciousness. Complete muscle failure occurs at 82.4ºF (28ºC). This article is not addressing wilderness living skills or long-term self-reliance. We’re talking about staying alive in an unexpected stay in the woods. You can’t very well pursue long-term stuff if you’re not equipped to survive the short-term storm. And, by storm, I mean – when you need immediate help and none is available – in a wilderness setting. The first step to being equipped is to always carry equipment. No matter how many debris huts you’ve built, you’d be a stupid survivalist, and possibly a dead one, to not pack some sort of emergency shelter option, fire kit, metal container, cordage, and a knife. Below is my emergency kit I carry no matter how long I plan to be in the woods. Emergency Space Blanket ~ The best 12 ounce item in my kit for core temperature control. I also carry two contractor grade garbage bag and a painter’s tarp – too many uses to mention here. Fire Kit ~ Three different ignition sources which I’m comfortable using – open flame (Bic lighter), spark ignition (ferro rod), solar ignition (magnifying lens), sure fire (diy and commercial), duct tape, and a bit of dry tinder material. Knife ~ There is no such thing as “The Best Survival Knife”. Beware of the marketer’s hype surrounding these ultimate survival tools. Metal Container ~ A metal water bottle can be used to boil water, make char cloth, cook meals, and perform self-aid duties. Cordage ~ I carry both 550 paracord and tarred mariners line. 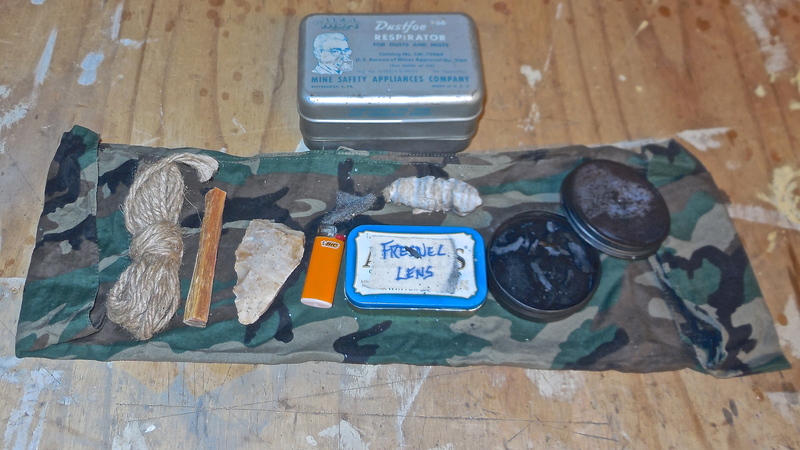 These items are my bare bones kit and go with me camping, hiking, backpacking, and hunting. Don’t think you’ll ever need these kit items? Think again. 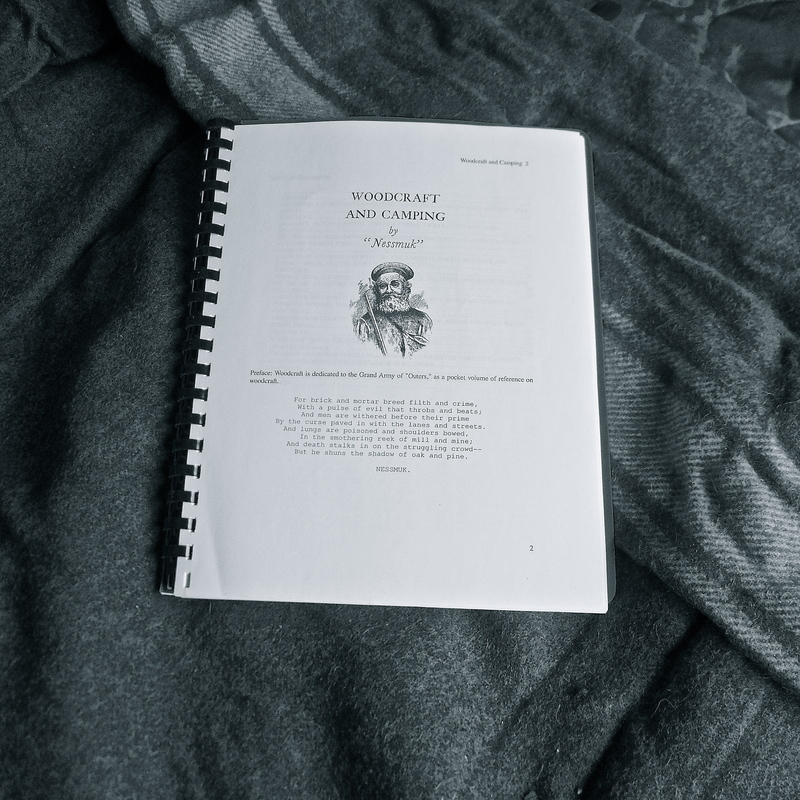 Read this real-life survival story of an injured hunter in the Idaho wilderness. Conserving body heat is the key to survival. Your body produces heat from biochemical reactions in cells, exercise, and eating. Without a furry coating like lower animals, insulation to maintain a body temperature at 98.6 degrees F is critical. Sins of Sheltering: Not carrying an emergency space blanket and wearing improper clothing. While having an emergency space blanket is important, your shelter is built before you ever step over the door sill of your warm and cozy home. Your clothes are your first layer of shelter. Thermal energy always travels from warm/hot (your body) to cool/cold (the environment). To trap body heat, layer your clothing. Layers create dead air space much like the insulation in house walls and attics. Layering is activity-dependent. But the basic concept applies to any outdoor cold weather activity. A.) Base Layer ~Your base layer should fit snuggly to your body. Long sleeve shirt and underwear made of polyester blend for wicking perspiration away from my body. Sock liners go on first before wool socks. Thin wool glove liners are worn inside my larger leather mittens. C.) Outer Layer ~ Waterproof is not your friend. Yes, it will keep rain and wetness out, but it will also seal perspiration in eventually soaking your insulation. Wear a weather-resistant shell that allows moisture to escape. The main concern for this layer is to block wind. Your head, hands, and feet are included in this layer. I’m partial to wool hats to keep my bald head warm. In subzero temps, I wear my shapka, a Russian red fox winter hat, I bought in Siberia in the early 90’s. Cold feet are deceptive. Frostbite can happen before you know the damage is done. Wear polyester sock liners with wool socks inside your footwear of choice. Our local BSA troop learning how to set up an emergency tarp shelter. D.) Waterproof Shelter ~ Again, for emergency essentials, you can’t beat a good space blanket to block wind, rain, and reflect heat back to your body. Combined with a plastic painter’s tarp, a Kochanski Super Shelter can keep you warm in subzero condition in street clothes. Use two large contractor garbage bags filled with leaves, wet or dry, for an insulating ground pad. This emergency shelter weighs ounces but offers pounds of insurance against a long cold night in the woods. There are many more options for waterproof covering. The above items are for your emergency kit. Sins of Fire Craft: Not carrying multiple ignition sources and all-weather fire starters. Fire covers a multitude of ‘sins’ in your survival skills. Even if you deliberately commit the offense of not packing emergency shelter, fire forgives your lapse in judgement. Scantily clad in the wilderness? Fire covers your wrongdoing. No matter how you “miss the mark” in skills or equipment, fire can save you. Are you a fair-weather fire crafter? That’s a good place to start. Nothing wrong with learning in the most fire-friendly conditions. You’ve got dry tinder, kindling, and fuel to burn. This may not be the case when your life depends on making fire in the wind, rain, and snow. There is absolutely no such thing as cheating when it comes to building a life-sustaining fire. Who cares what Bushcraft purists think! Your loved ones aren’t worried about style points in fire craft. They want you home alive. So cheat! Fire Cheat #1 ~ Ask yourself this question, “Could a five-year-old start a fire with my emergency fire kit?” Don’t get too bushcrafty. I know ferrocerium rods are popular, but you can’t beat a thumb drill fire (Bic lighter) when you really need fire. Fire Cheat #2 ~ One of the most overlooked fire starters that should already be in your pack is duct tape. Loosely wad up about 2 foot of tape and ignite it with an open flame. A ferrocerium rod will ignite duct tape but don’t rely on sparks. You have to shred the tape to create lots of surface area. This isn’t your best option if your fingers are losing dexterity in freezing temperatures. Fire Cheat #3 ~ DiY fire starters made of wax-soaked jute twine or cotton makeup remover pads. I also carry commercially made sure fire that will burn on water. Fire Cheat #4 ~ Always carry enough dry tinder material to start a fire in sucky weather. Fire Cheat #5 ~ Know where to find the best possible tinder material and how to process it to create surface area. Dead hanging branches, pencil lead size to pencil size, provide kindling even in the rain. 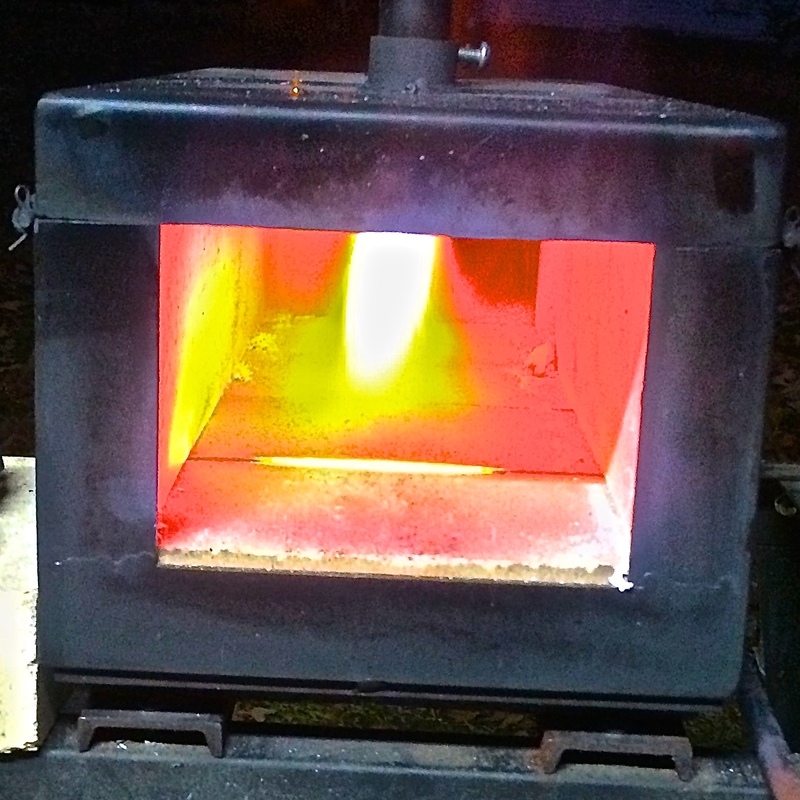 Fire Cheat #6 ~ Fat lighter’d (aka – fatwood, resin-rich pine wood) is my lifesaver in the south. Discover your best natural fire starter wherever you’re located or plan to travel. I keep this stuff in all my kits. It’s abundant where I live. Fire Cheat #7 ~ Dry wood is available in all weather conditions if you know where to look. Standing dead Tulip Poplar (Magnolia) is one of my go-to fire resources. The trick to getting to the dry wood is splitting the wood down to tinder, kindling, and fuel size material. The inner bark makes excellent tinder bundles! A knifeless man is a lifeless man. The “survival” knife market is full of gadgetry. Gadgets are for gawkers. You don’t need a Rambo knife to survive. You just need a solid knife and some skill. Carry a good knife and practice with what you carry. Your knife may become your one-tool-option. Most importantly, your knife should feel right in your hand as you use it. Knife Sins: Carrying a knife but never becoming competent with your blade. You’re not going to be carving spoons and bowls in a short-term survival situation. Your edged tool will be used to make shelter and fire to control core temperature. I’ve written about the number 1 knife skill here. Even if you’ve committed the first two survival sins, your blade can save you. A knife in skilled hands can create fire from scratch. I don’t rely on friction fire as my first choice but do practice the skill in case I run into unknown unknowns. With my buddy Bic in my pocket, I still need to process sticks to make fire quick. Both the cutting edge and spine of your knife are used to create surface area needed for ignition. When cold and wet, your fine motor skills are probably suffering. Pretty feather sticks are for style points. Style won’t save you. Fire will! Split a dead wrist-size stick with a baton and knife into thumb size pieces to get to the dry stuff. Split a few of those pieces into smaller kindling. Grip your knife with a reverse grip (cutting edge facing up) and use the spine of your knife to scrape a pile of fine shavings off one of the larger split sticks. If you’ve got fat lighter’d, scrape off a pile of shavings the size of a golf ball. Ignite this pile with a lighter or ferro rod and feed your fire its meal plan. Debris shelters can be built without a knife. Sticks can be broken to length between two trees without a cutting tool. Keep in mind that this type of shelter will take several hours and lots of calories to construct correctly. 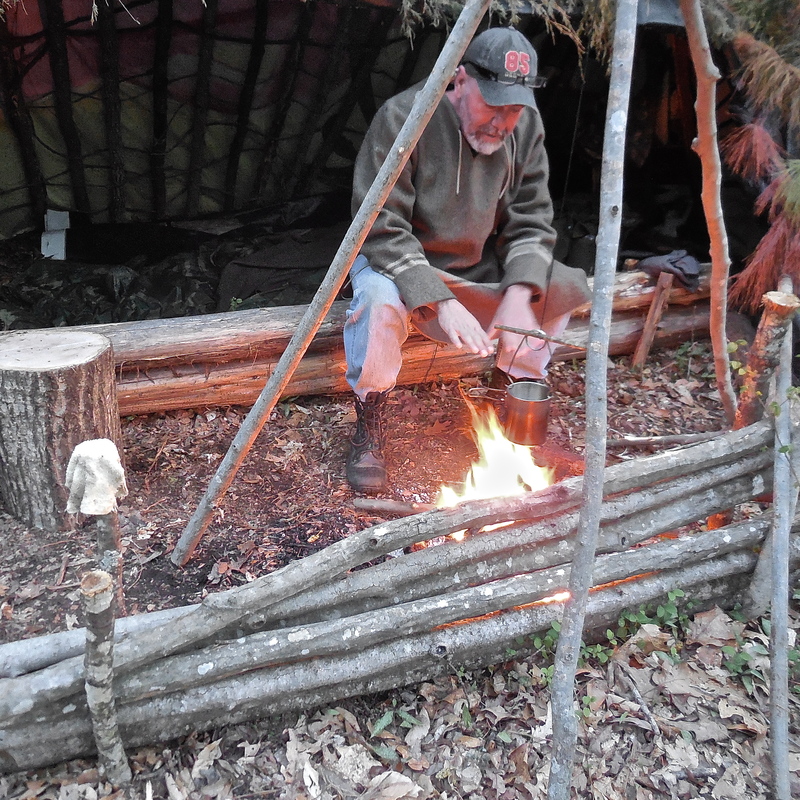 The role of the knife in emergency shelter building is secondary compared to its importance in making fire. You won’t even need a knife to set up a space blanket shelter if you prepped your emergency kit ahead of time. Blades are expedient in cutting cordage, notching sticks, harvesting green bows for bedding, making wedges to split larger wood without an ax, and a number of other self-reliance tasks. All three of these survival skills are needed for emergency core temperature control, but I’d place fire on top of my forgiveness list. Fire can make water potable for hydration, warm poorly clothed pilgrims, cook food to create body heat, smoke signals, illuminate darkness, and comfort the lost. What’s your top skill for controlling your core temperature? Share if you don’t mind. Read the next two lines and stop. Look around you. Make a mental note of all the useful stuff produced from two resources… wood and metal. Really, stop reading for a second! What did you come up with? If you only noted the obvious wooden and metallic items, go deeper. With a little thought, your list should grow exponentially. The fact is, wood and metal were directly or indirectly responsible for building your house, mailbox, wall clock, sofa, and the electronic device you’re reading from this very moment. Wood and metal go together like peas and carrots. 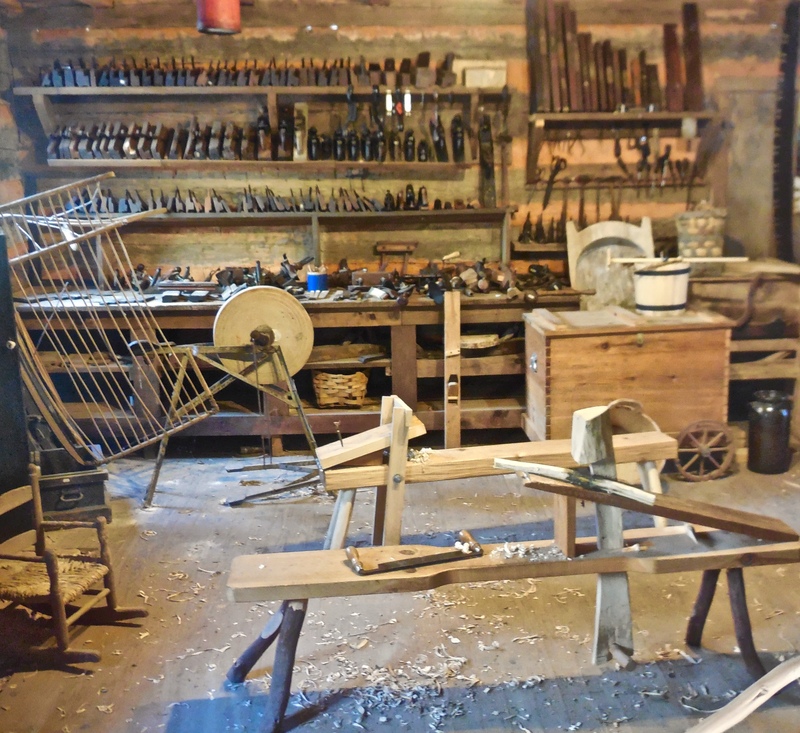 Metal tools are used to shape wood. But wood creates fire to heat metal for making said tools. And don’t forget about the useful wooden handles attached to metal tools. There’s a relationship between the two resources in which both benefit from the other. In biology, we call this mutualism. For long-term self-reliance, learning to manipulate and exploit these resources will make you an indispensable asset to both family and community. Except for harnessing fire, nothing in human history compares to the discovery of metal and its ability to be molded, formed, and poured into useful shapes. Blacksmithing is the only craft that makes their own tools and the tools of other craftsmen. You don’t have to dial back in time too far to find Bob the Blacksmith being the most prominent tradesman in town. In need of a gate latch? Go see Bob. How about that crack in your froe? Bob can forge weld it and have you back splitting cedar shakes for your roof in no time. Making a hammer for your flint-lock rifle could be done by Bob. To build a functional smithy, you’ll need a few tools. No need to spend a boatload of money to get started either. Shop yard sales, flea markets, scrap yards, farm auctions, estate sales, and antique stores – the highest prices are usually paid at antique stores. Anvil ~ A real blacksmithing anvil may be your largest cash outlay. A common man’s anvil can be a section of railroad track or large block of metal – 100 plus pounds mounted to a wooden stump. 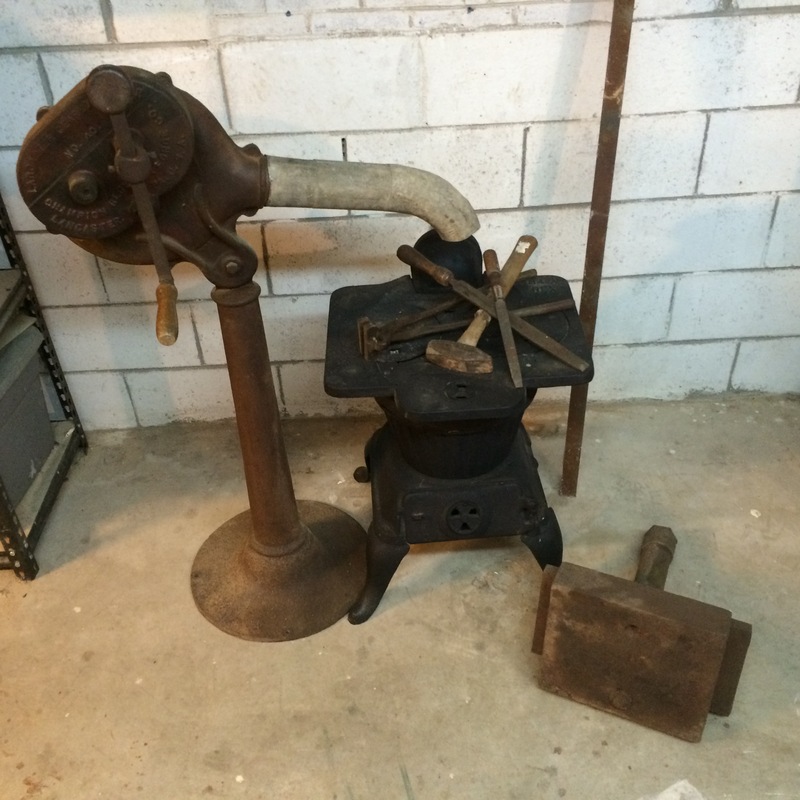 Forge ~ Charcoal, coal, or gas-powered, the forge will heat your steel for shaping and tempering metal. It doesn’t have to be elaborate. A hole in the ground will work. Some sort of blower to increase heat in your coal or charcoal. Blowers are not needed for a propane forge. Hammer ~ A 2 to 3 pound hammer to work hot metal. You can add to your hammer collection over time. There are four basic types of hammers for moving metal: straight peen, ball peen, cross peen, and sledge. Tongs ~ Long handle pliers used to grip hot steel while hammering. Vise ~ A bench vise mounted on a sturdy work bench. I’ve yet to acquire a blacksmithing post vise. Quench Bucket ~ Container large enough to hold about 5 gallons of water to cool hot metal and for tempering. Safety Equipment ~ Eye protection, ear protection, leather boots, natural fiber clothing, welding gloves, fire extinguisher and water bucket/hose, first aid kit. Like other crafts, there are almost endless numbers of tools and items you’ll want to acquire as your skill level increases. The “anvil” (lower right) is a solid piece of steel I’ll mount to a stump. Though I’ve always known the importance of this craft historically, my dabbling has only produced a few items. However, after a recent Georgia Bushcraft camping trip, I realized it’s time to get serious about hammering steel. Stephan Fowler of Fowler Blades spent two hours in the rain demonstrating, in less than optimal conditions, the process of turning a file into a functional cutting tool. The blade was not his best work considering he used a crumbly rock as an anvil, an air mattress pump for a billow, and burning chunks of hardwood on the ground as his forge. I was honored to have won Stephan’s survival file knife in a fire-building challenge during the campout! Check out what Stephan produces when he has access to his real forge → here. Your skill level doesn’t have to be superior to be useful for long-term self-reliance. The more you hammer steel and study metallurgy, the better you become. 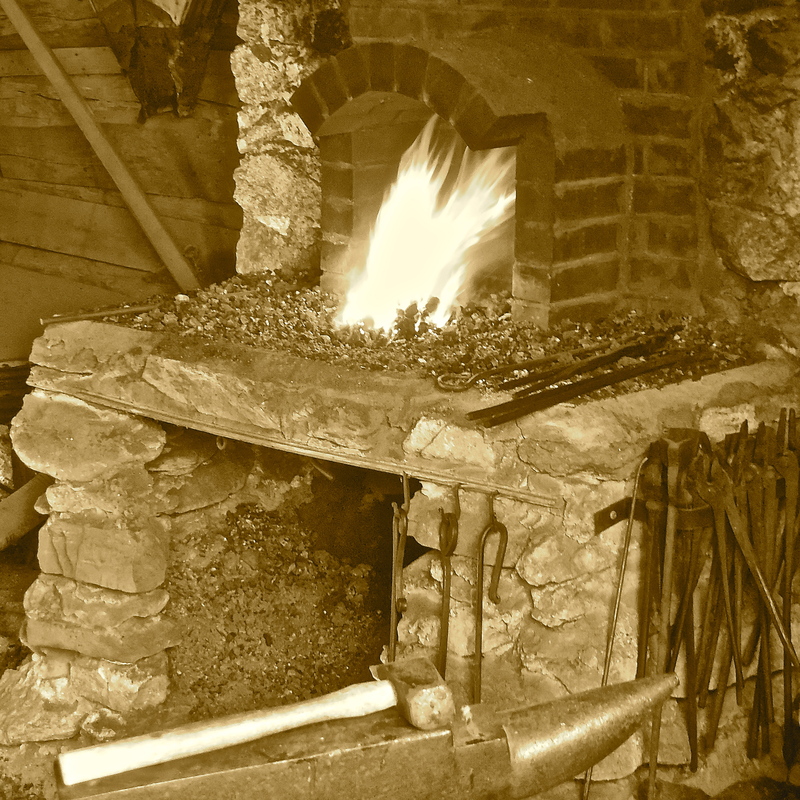 Blacksmithing in America was hot and heavy during our pioneer days in North America. Not long after the Industrial Revolution, the art of blacksmithing survived only as a specialty craft. Thankfully, the secrets of metallurgy, once guarded in guilds, is being passed on through modern-day blacksmiths. Here are a few resources that I’ve found helpful in connecting with local craftsmen. Artist Blacksmith Association of North America. Look for state and local chapters in your area. I found the Ocmulgee Blacksmith Guild from the previous site and attended and met local blacksmiths a few years ago. Book ~ Mechanick Exercises: Or the Doctrine of Handy-Works. This is a facsimile reprint of the Third Edition from 1703. Warning… Old English descriptions of metal and wood working. The craft of woodworking compliments blacksmithing more so than any two trades I know. Developing the skill to make handles for metal tools or mill lumber from a tree to accept the nails you forged on your anvil could one day feed your family in hard times. I’ll bet your master gardener neighbor would be willing to barter food for tools and repairs on her homestead. 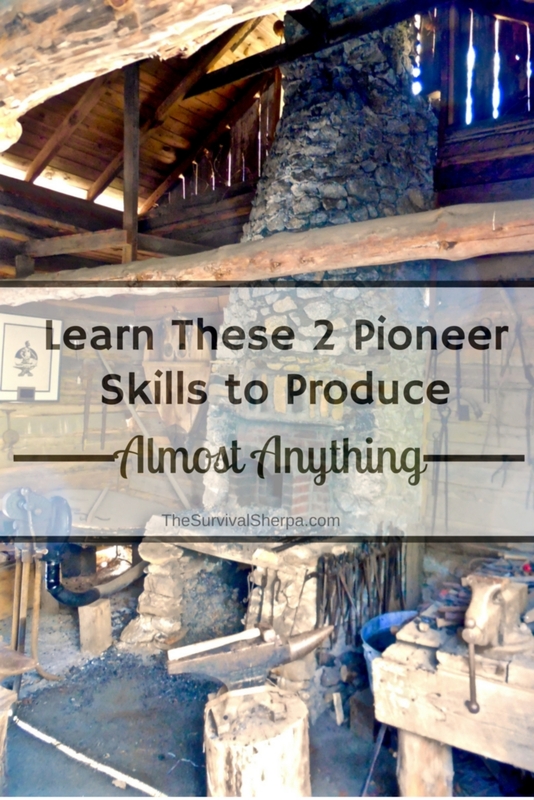 If you’re like me, you find yourself dabbling in all sorts of pioneer skills. One skill I’ve become proficient at is carpentry. However, take away my power tools and my skill level drops several notches. Working wood with pioneer tools is based on the same principles as modern woodworking… with a steeper learning curve and physicality. Don’t abandon your power tools. 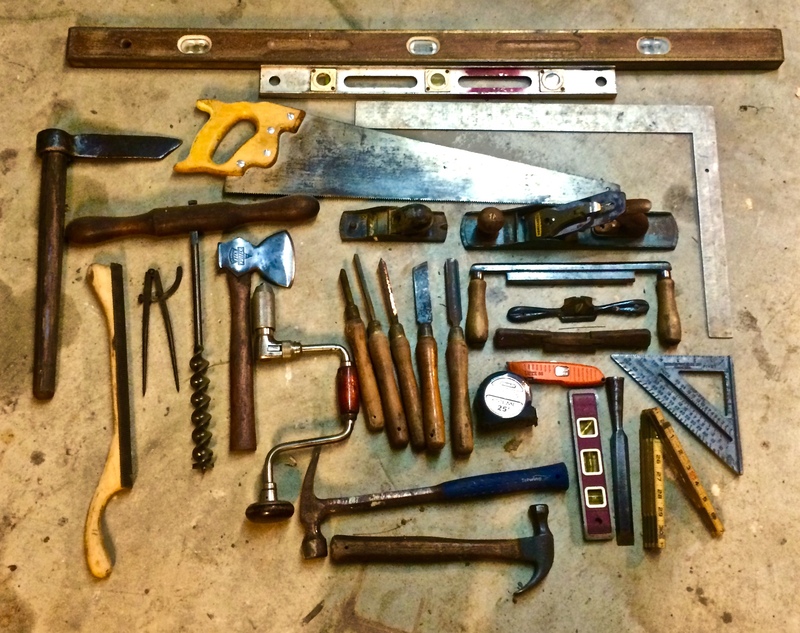 Here’s my list of basic wood working tools, both modern and pioneer style. Hammers ~ A 16 oz. claw hammer and a larger framing hammer (20 oz.) to get you started. Saws ~ Circular, chop/miter, table, jig, reciprocating – cordless and corded. Cordless 18v batteries can be charged via solar chargers if the need arises. Drills ~ Cordless impact driver and drill, corded drill press, and an assortment of drill bits (wood and metal), screw bits, and socket bit adapters. Squares ~ Tri-square, combination, speed square, and carpenter’s square. Used to mark and test angles. Buy metal squares to use with hot metal work. Plastic melts. Levels ~ Torpedo, 2 foot, and 4 foot bubble levels keep things plumb. 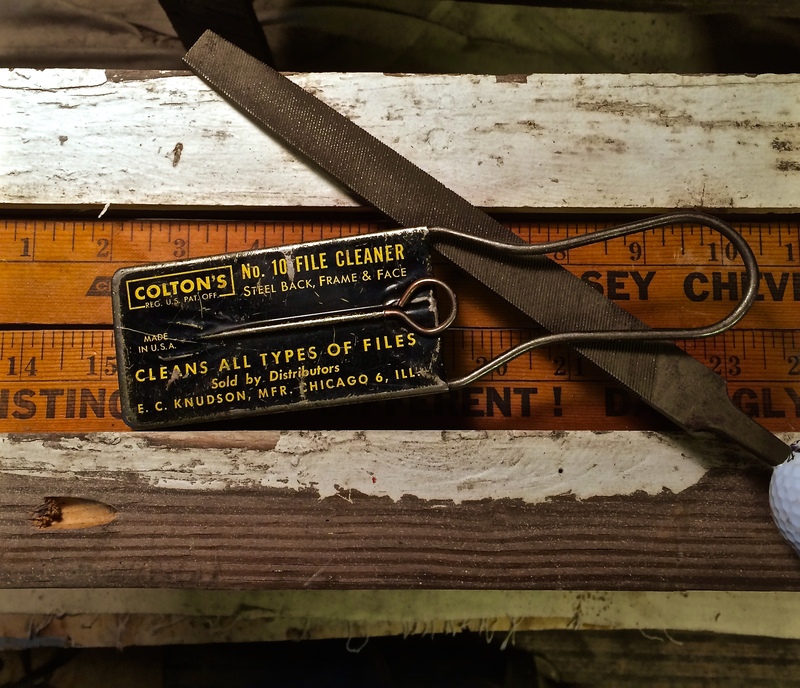 Measuring and Marking Devices ~ 25 foot steel tape measure, wooden folding ruler, carpenter’s pencil, chalk line. Utility Knife ~ One of my most used tools on my belt. Saws ~ Hand saws: crosscut, rip, compass saw, coping, and bucksaw. Drills ~ Brace and bit, augers, bits of various sizes. Squares ~ Same as listed above; Tri-square, combination, speed square, and carpenter’s square. Used to mark and test angles. Buy metal squares to use with hot metal work. Plastic melts. Levels ~ Torpedo, 2 foot, and 4 foot bubble levels keep things plumb and work as straight edges. Measuring and Marking Devices ~ 25 foot steel tape measure (roughing work), wooden folding ruler, steel drafting ruler (bench work), pencil, chalk line. Smoothing Planes ~ Both long and short. Stanley makes great planes and can be had inexpensively but may need some TLC to make them useable. Chisels ~ A variety of sizes kept super sharp… which I’m known not to do. Draw Knives ~ Draw knives for roughing wood to shape and spoke shaves for finishing form. Shave Horse ~ Holds stock freeing both hands to work wood with a draw knife or spoke shave. Froe ~ A simple tool used to split (rive) wood into shingles, boards, and staves. Rasp ~ Both flat and half-round. A 4-in-1 rasp is utilitarian. Notice I didn’t delve into the actual skill sets needed. That would take a long time and lots of bandwidth. However, I do recommend that you begin stockpiling metal and woodworking tools. They may be useful one day. Oh, and never pass up scrap metal. Collect lawn mower blades, leaf springs, bar stock, round stock, pallet wood, hardware (nails, screws, nuts and bolts), old files, tool steel, sharpening devices, sheet metal, saws, etc., etc. 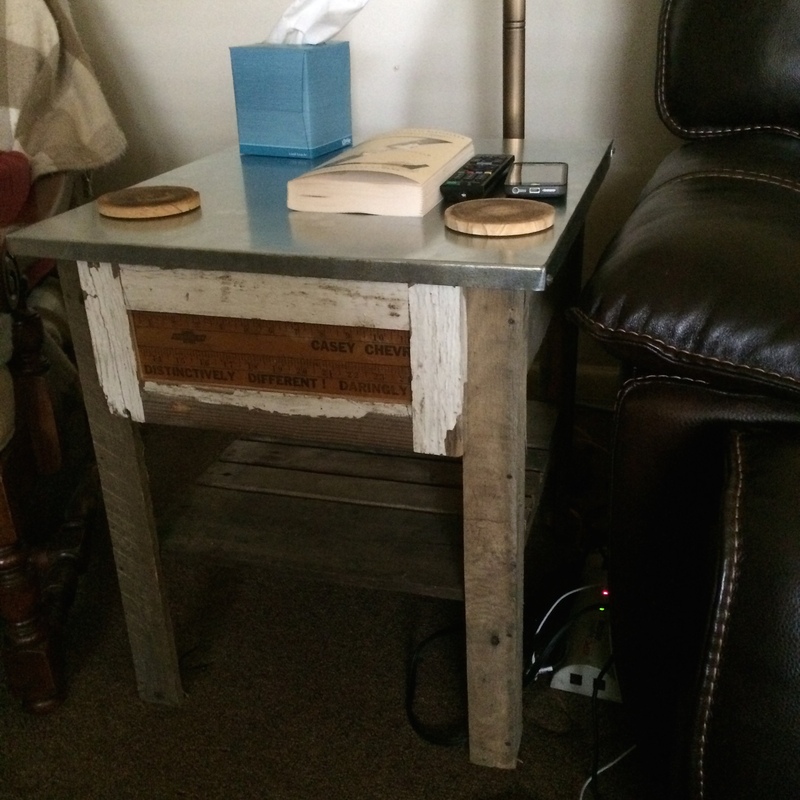 I made this end table for DRG from pallet wood, 150 year-old house siding, an old yard stick, and sheet metal. Real stuff, almost all stuff, can be made from skilled hands with metal and wooden tools. Learning to work these two resources may start as a hobby or pastime but could very well insure your livelihood in hard times. Did you think of anything that was made without metal and/or wood being directly or indirectly involved in the process? Bet you didn’t. Doing the Stuff with your gear is the most overlooked skill in the world of prepping and survivalism. In general, we tend to think un-tested gear will get us through any crisis. Just whoop out that new shiny object from your kit… you know, you’ve seen the YouTube videos. You and your family are forced, for whatever reason – really doesn’t matter why, to grab your bug out bags and get out of dodge… on foot. You’ve got 5 minutes to get out. Immediately you realize the weight of your bag alone will make your journey impossible. 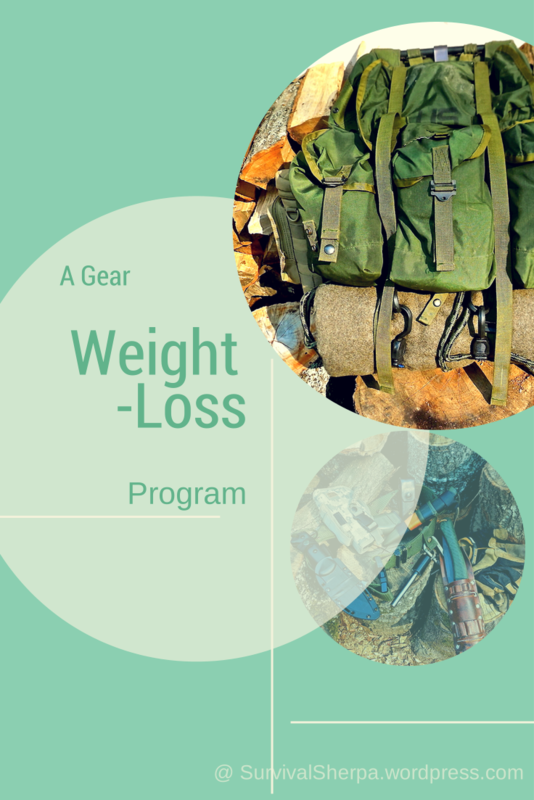 Time to go on a weight-loss program – for your gear! As some of our regular readers know, I’ve built a semi-permanent shelter in the woods. It’s my personal space where I go to get centered, re-humanized, and enjoy nature. From a survival point of view, my personal space gives me a convenient location to build skills. More importantly, it’s a weight-loss center for gear. It does a pretty good job of keeping extra pounds off the body too. On to the gear weight-loss program. My first overnight outing in my shelter helped me lose extra gear weight. Granted, it was only a one-night-stand. But that one night with a new ALICE pack (All-Purpose Lightweight Individual Carrying Equipment) was needed to compare with my old 3-day assault bag. You see, with larger packs, I tend to over pack. The smaller ALICE forced me to downsize and prioritize my gear. Anytime I head out for some dirt time I pack, at a minimum, the first five of Dave Canterbury’s 10 C’s of Survival. This trip was no different with one exception…. I overpacked ALICE to test her fit, finish, carrying capacity, and comfort. Below you’ll see what I packed, what I actually needed, and what I’ll leave behind next time. I packed way too much stuff for an overnight trip. But remember, I needed to get ALICE in the woods for the first time. 1.) Cutting tools. These items are the hardest to trim for me. My only excuse is that I love sharp stuff! BK2 – A pure tank of a knife with a 1/4″ full tang 1095 steel blade. 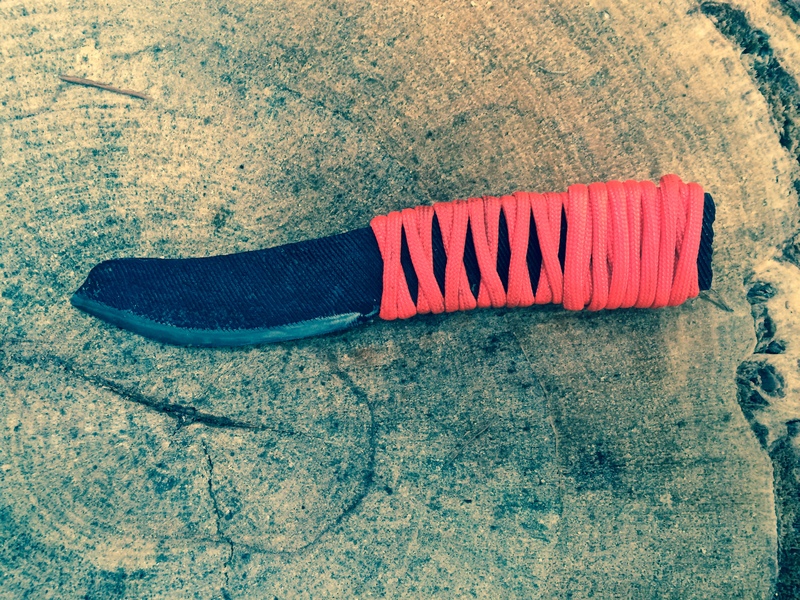 Mora Companion – I find it more useful around camp for finer knife work. It rides around my neck via a lanyard. Swiss Army Knife – Stays in my right pant pocket whenever I leave the house. Bacho Laplander – This folding saw was used for a lot of cuts on my shelter. Ax – Wetterlings 16″ Hunter’s Ax. Small enough to fit into my rolled up bedroll, yet large enough to handle most tasks around base camp. Almost Free Ax – I know, overkill for one night. Told you sharp stuff was my kryptonite. 2.) Combustion. Fire is life out there. 4.) Container. For cooking, water, etc. 5.) Cordage. Hard to make in the wilderness – easy to just pack some in your kit. 7.) Cotton. 100% cotton rag or bandana can be used for bandaging wounds, char cloth, and many other survival uses. 9.) Cargo tape. This may be the most versatile item in your kit. 10.) Canvas needle. From repairing gear in the field to removing splinters. That’s the 10 C’s. Now for the other stuff. By far the most used knife was my Mora Companion neck knife. There wasn’t a lot of heavy-duty campcrafting needed so my BK2 stayed in its sheath. I did cut a sapling with the BK2 to mount a frog gig on the end. Also used the packaging tool on my SAK to tighten bank line lashing on the cooking tripod I made. The Wetterlings ax saw minor action harvesting saplings for the cooking tripod. The Almost Free Ax was never unmasked. The pliers on my multi-tool was used to remove a container of boiling water from the toggle on the tripod. The Bacho folding saw was use to harvest dead-fall poplar wood for a bow drill set. To shape my spindle, the Mora was all I needed. Used a Bic lighter and feathered fat lighter’d stick to light the camp fire. I was lazy and didn’t feel like practicing primitive fire skills. That’s why I carry a lighter. My shelter was already built. I still carried my poncho which came in handy as an extra layer of insulation over my wool blanket. The cook set served me well alone. With more than one person, a larger cooking pot/pan would be needed. NONE! Add a larger bush pot. The 25 ft of tarred bank line was used to lash the cooking tripod. Since my shelter was already built, no other cordage was needed. NONE! Pack 50 ft of tarred bank line next trip. 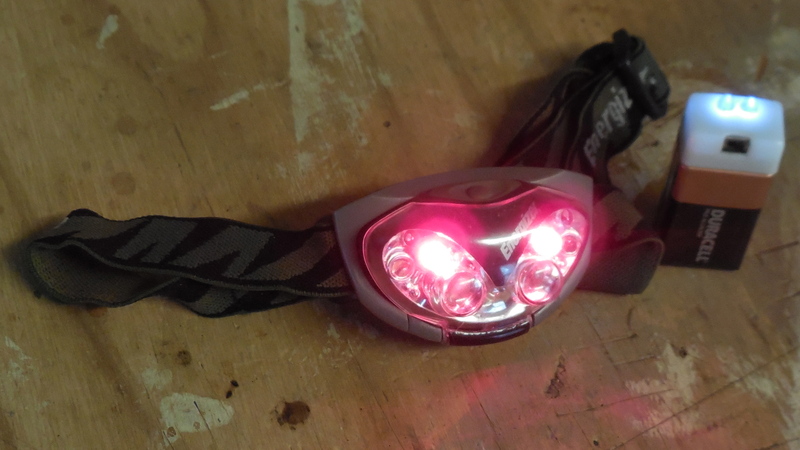 My LightSpecs, headlamp, and Pak-lite saw the most action on this trip. A couple of times I almost reached for my StreamLight as the coyotes got closer in the middle of the night. Pak-lite LED flashlight. Although, for the small amount of added weight, I’d probably keep it in my kit. #7-10 – Cotton, compass, cargo tape, and canvas needle (repair kit) would stay the same. It’s really not surprising, at least to me, that I didn’t drop much weight on the 10 C’s. Those items are essential to survivability. With these tools and the knowledge and skill to use them, you increased your odds of comfortably surviving a wilderness or bug out journey. A.) The importance of thermoregulation can’t be overstated – even in 45º temperatures. By 2 AM, I woke up to cold feet. I had let the fire die down and had not collected enough fuel to see me through the entire night. I draped my poncho over the wool blanket to add an extra layer of insulation. This did the trick. Another point worth discussing is the lack of insulation between me and the ground. Though the ground wasn’t frozen like our neighbors to the north, the ground cloth and poncho liner was too minimalist. My remedy will be to add a foot of dried leaves and straw with the billboard on top of that layer as a moisture barrier. B.) On firewood: Collect two or three times the amount you think you’ll need for the night. The shelter was designed to capture radiant heat via the reflecting wall and the overhang on the front of the shelter. The cool weather wouldn’t have been a problem if I had harvested enough fuel. C.) For practice runs of one or two nights out, lose as much gear weight as you comfortably can. Make a note (an actual list) of what you needed and what turned out to be extra weight. Pack accordingly on your next outing. For instance, I primarily used one knife. That knife should be a full tang, 5 inch high carbon steel blade or longer, 90º angled spine, and non-coated. For me it’s my BK2. Although I use my Mora as a backup. D.) My water filter wasn’t working properly. I boiled water for cooking and drinking via the bottle cook set. To loose gear weight, you have to test your stuff. Your bug out bag or bushcraft kit should be in constant state of evolution not a shiny object storage compartment. There’s no such thing as a perfect kit. But that doesn’t stop us from trying to create one. As skills increase, gear will decrease. What skill would help you lose gear weight? P.S. – You can also keep up with the Stuff we’re Doing on Twitter, Pinterest, Google +, and our Facebook page. Ready to trade theory for action? Join us in the Doing the Stuff Network on these social media sites: Pinterest, Google +, and Facebook. Use the hashtag #DoingTheStuff when sharing your stuff on Twitter. Copyright Information: Content on this site (unless the work of a third-party) may be shared freely in digital form, in part or whole, for non-commercial use with a link back to this site crediting the author. All links in articles must remain intact as originally posted in order to be republished. If you are interested a third-party article, please contact the author directly for republishing information. Is This Cotton Pickin’ Killer in Your Winter B.O.B.? Hikers and other outdoorsmen are fond of the ‘cotton kills‘ meme. Search these two words and you’ll wonder how grandpa survived frontier life without polypropylene! An APB has been issued on this serial killer! The survival and prepping community should take note. If you’re a lover and wearer of killer cotton, the Bug Out Fashion Police won’t be summoned to whisk you off to polypro prison and re-education camp. Dirt Road Girl and I repack our 72 hour bags for fall/winter each year. If we ever need to grab and go, we know our kits would contain synthetic, wicking base layers from head to toe. Humidity is high in our state and I sweat a lot with a 30 pound pack strapped to my back. Synthetic material against my skin does a great job at wicking moisture to outer clothing layers. Do we pack killer cotton in our winter kits? Yes. It has its place and uses. Killer cotton is not lethal. Choosing the wrong clothing for your situation and environment kills! So how did this natural, comfy fiber get such a bad rap? Cotton gained the label ‘killer’ by distance hikers for its lack of capillary (wicking) action. To explain, I’ll slip on my lab coat and grab some chalk for a science lesson. I’ll do my best to keep this accessible to our non-geek readers. Conduction – is the transfer of heat when ‘hot’ molecules collide with neighboring cold molecules. Only heat can be conducted because cold is the absence of heat. Ex: I discovered early on that heat travels from the hot end of Mama’s cast iron skillet to the cold handle. Insulator – materials that are poor conductors of heat. Air, cloth, wood, and water are poor conductors but make great insulators. Heat transfer – thermal energy (heat) can be transferred via conduction, convection, and radiation. When dry, cotton fibers create air pockets to insulate your body. Air is an awesome insulator if it’s trapped in an area. However, cotton earns ‘killer’ status when wet. Cotton is a stingy absorber of moisture. Once saturated, it holds moisture better than polyester. When you step out of the shower, do you grab a cotton towel or synthetic one? Cotton holds on to what it absorbs. Cotton soaks up moisture but does a lousy job of moving it away from your skin to outer layers of clothing. Your 100% cotton union suit looses its insulation value when the air pockets in the fiber fill with moisture from perspiration or water. The 50/50 cotton blends only prolong the process a bit. Either of these choices will leave you wet and cold! The problem with being outside is Mother Nature’s mood swings. She seems to invent ways to make you shiver. If these conditions continue, hypothermia happens without self-directed action to reverse the drop in your body’s core temperature – even when it’s not freezing out. So to be prepared, plan for the unpredictable. Since humans aren’t feathered or fury (up for debate in some cases), the layered clothing strategy creates warm air pockets to slow the heat transfer from your 98.6 degree body to the external frigid temperatures. You’ve seen pictures of Sherpas standing on the top of Mt. Everest wearing a down-filled jacket. It’s not the feathers that insulate, it’s the air space created by the down trapped by the jacket shell. Remember that heat transfer takes place from hot to cold – not the other way around. Nature is constantly trying to create equilibrium. Thermal energy (heat) and humidity under your clothing seeks a path to colder, less humid conditions outside your body. The first step in creating and maintaining that warm pocket of insulating air around your body is to stay dry. Due to its capillary action, I prefer polyester as a base layer against my skin. On top of that, when conditions are cold but not wet, I wear a long sleeve cotton shirt with a wool sweater. When it’s likely that I’ll be in wet/cold conditions, or some Doing the Stuff training with my B.O.B., I skip the cotton and go with a light merino wool or wool synthetic layer. Frugal Tip: Never pay full price for expensive wool sweaters. Shop your local thrift stores and stock up on $5 merino wool. Ugly colors won’t matter when you need to stay warm and dry! Wool contains thousands of natural air-trapping pockets for breathable insulation. Just ask any sheep. 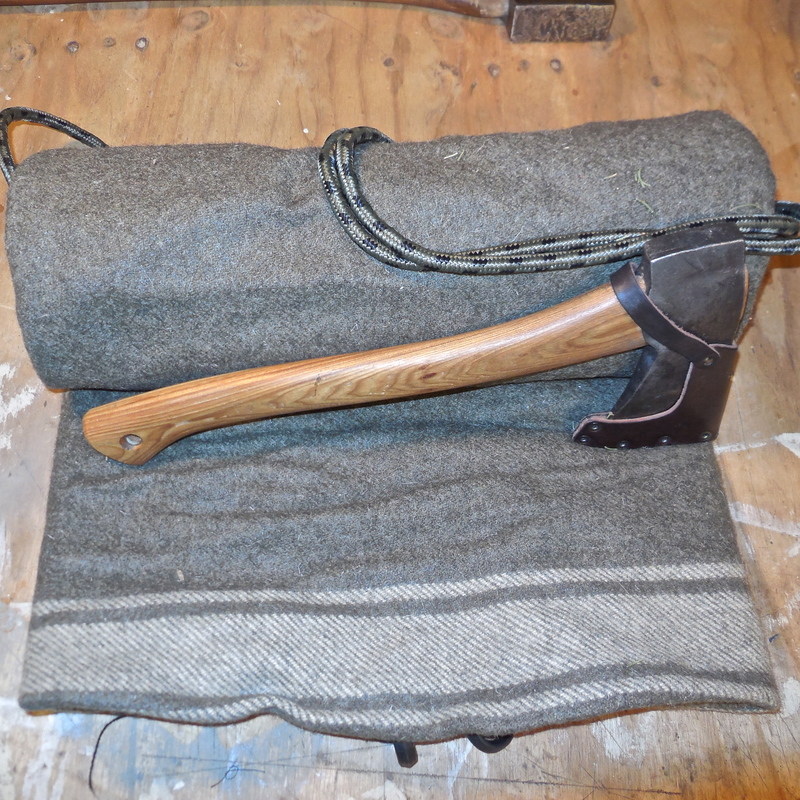 Here’s a 100% wool army blanket I hand stitched to make a wool hunting shirt. Now to add ‘skin’ to your outfit. The outer shell or skin can be anything that repels water. In a pinch, a contractor garbage bag will work to keep you dry. Gore-Tex is pricey. You can pick up USGI poncho cheaply online or at military surplus stores. A poncho in your kit gives you options other than rain protection. Smart folks are prepared for both wet and cold conditions! 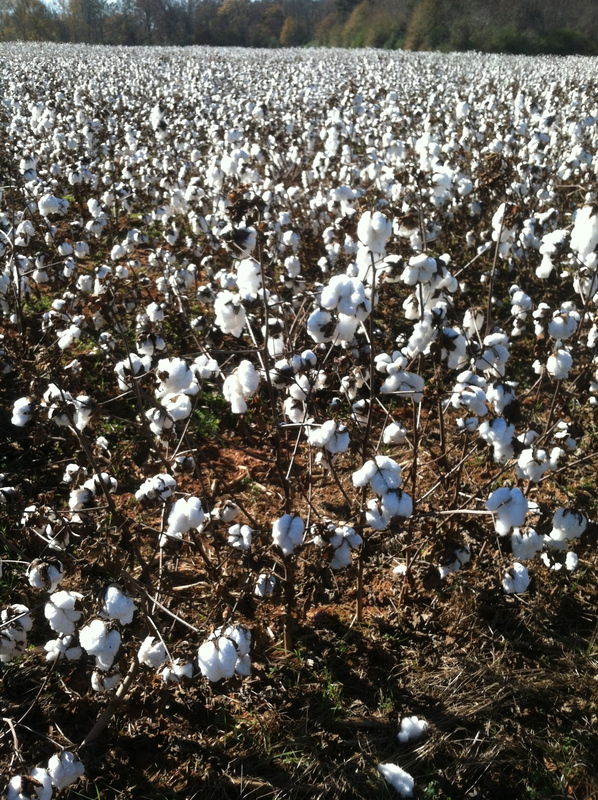 Does Killer Cotton have a place in your winter Core Temperature Control strategy? You bet! Here’s my top 5 reasons to pack cotton. High count bed sheets can be turned into lightweight, waterproof, fireproof tarps. Bandana or shemagh for making char cloth for your next fire. Self aid – cotton and duct tape can be used as a makeshift bandage, sling, wound compress, or tourniquet (as a last resort). Signaling device – orange bandanas contrast well in a woodland setting. Emergency toilet paper. 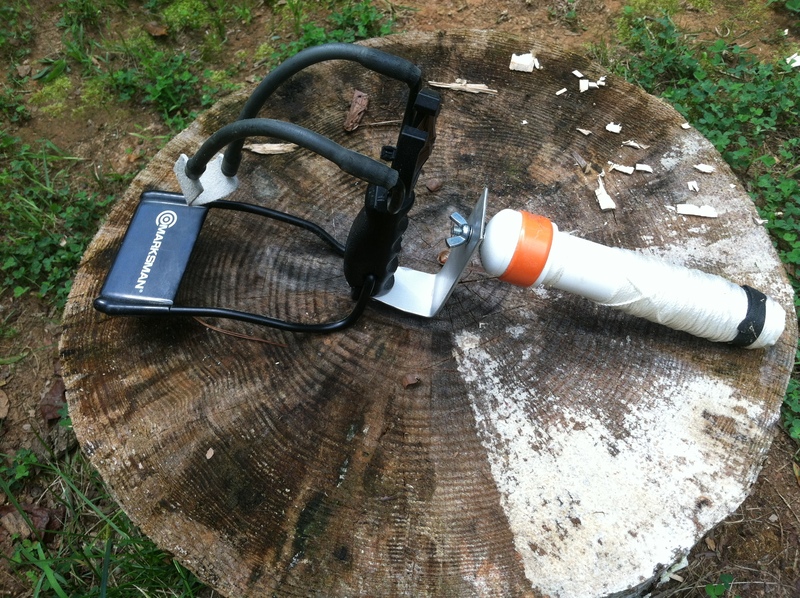 Ever tried wiping your business end in the wilderness with synthetic material? Our ancestors made it through extreme conditions without modern synthetic clothing. Would they have worn polypro underwear and base layers while forging the frontier? Probably. Is Killer Cotton part of your Core Temperature Control strategy? Stay safe and warm out there! [Todd’s note: I love Texas! My maternal grandfather came from the Lone Star State. A lot of great patriots and preppers call it home. Thanks Jim for adding value with your Doing the Stuff Tutorial! 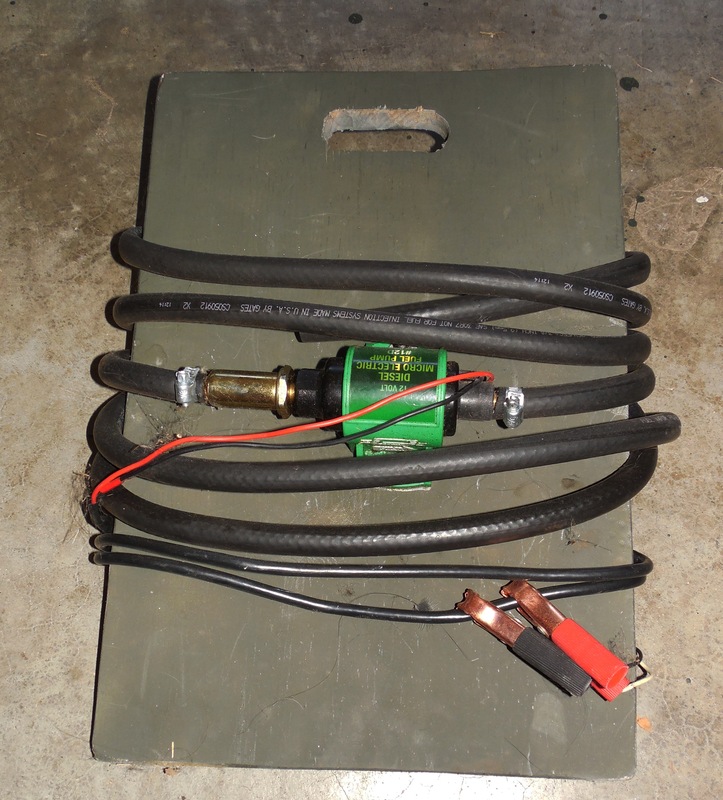 Here is my electric fuel transfer board. The board is plain pine that is 18″ long and 11.5″ wide. It has a 3″ long by 1″ wide hand hold cut in the top of it to grasp it easier. I painted the board OD GREEN to go with my military equipment I collect. It has a MR. GASKET diesel micro electric fuel pump #12D mounted to it, via two holes drilled and one bolt, two washers and one nut per hole that holds it in place. I also used the inline fuel filter supplied by Mr Gasket, though you could choose another type if you wanted to as there are lots of them available. 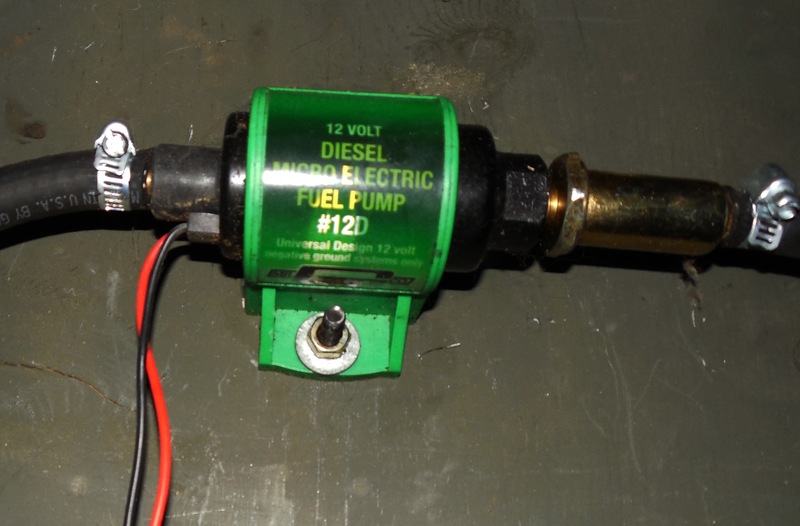 12-volt electric diesel fuel transfer pump is safe for diesel fuel use. Simple 2 wire design, self priming, includes 100 micron in line filter. 4-7psi 35GPH, small universal design allows easy set and installation anywhere. Solid state worry free electronics, 12 volt negative ground systems only. 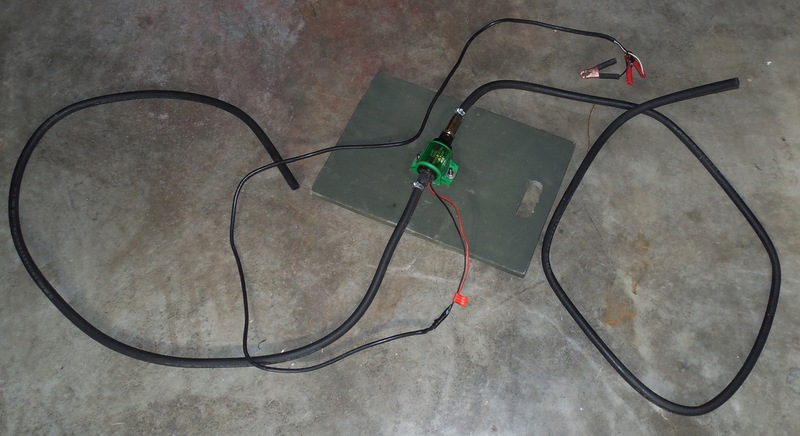 Once the electric fuel pump was wired with an additional 6′ of wire, I added two alligator clips. I then attached the inline fuel filter to the fuel pump. Next I added two lengths of 1/4″ fuel hose. On the outgoing side, I put a 7.5′ piece of fuel hose. On the incoming side, I put a 6.5′ piece of fuel hose. That gives me a total of 14′ of fuel hose from source to destination. It works great. I either use a battery in the vehicle I’m transferring fuel to OR carry a spare battery along when I’m out in the middle of nowhere to run this pump. While 35 GPH (gallons per minute) sounds fairly slow (and it is), MOST fuel tanks these days are 20 gallons or less. So you could fill a 20 gallon tank in about thirty to forty minutes. Please be aware that these days, new vehicles have some form of ‘anti-siphoning’ device built into the fuel filler tube before it reaches the tank. If, on the other hand, you drive military vehicles like I do, that is never an issue. Plus if you are just transferring fuel from one of your own fuel canisters, this is an easy, clean way to do so. If you do not have ANY of these items on hand, as I did, your overall cost would be around $110. That does not include the battery to run it. With the exception of the fuel pump and hose, I’m guessing on the cost of the other pieces. I ACTUALLY HAD everything but a new pump on hand and splurged the $50 for it. I made this several years go and it works every time I hook it to power. I also have these installed in my military vehicles, one of which I’ve owned more than four years. They all work every time you turn the key. If power is an issue, for fuel stored in barrels, I recommend a rotary hand pump. http://www.northerntool.com/shop/tools/product_200129224_200129224 – that link is for a ‘Fill Rite’ from Northern Tool company $200 (again, NO AFFLIATION, I just got mine there). Not cheap but will last for your lifetime. I hope that helps give insight into OTHER choices other than the fuel pump [Shaker Siphon] displayed here earlier. It’s a good alternative, but if you are serious about your preps, a great fuel transfer pump is the way to go. Whether you are transferring 5 gallons or 500, not having to do it by ‘sucking’ is a good thing. Could you survive in the wilderness with only a sling shot as your weapon? Lots would depend on your survivability. Having a means to harvest protein and animal fat would surely increase your chances. In a perfect world, the sling shot would not be my first choice. But having options makes one more robust. I first saw his video on his pocket hunter over three years ago before he was co-starring on Dual Survival. I was impressed. So much so that I turned my wrist rocket into a DIY version of his now patented Deluxe Pathfinder Pocket Hunter Kit. My version is rough, but functional. I have three points on arrows for my sling shot: fishing tip, broadhead, and judo points. Here’s a look at a judo point on a wooden arrow. Judo point ready to slay a spud. The purpose of the judo point is to snag on brush, grass, or the ground and flip the arrow up to make finding a missed shot easier. It’s used for hunting small game animals. The smallest game I could legally hunt today was Mr. Potato Head. 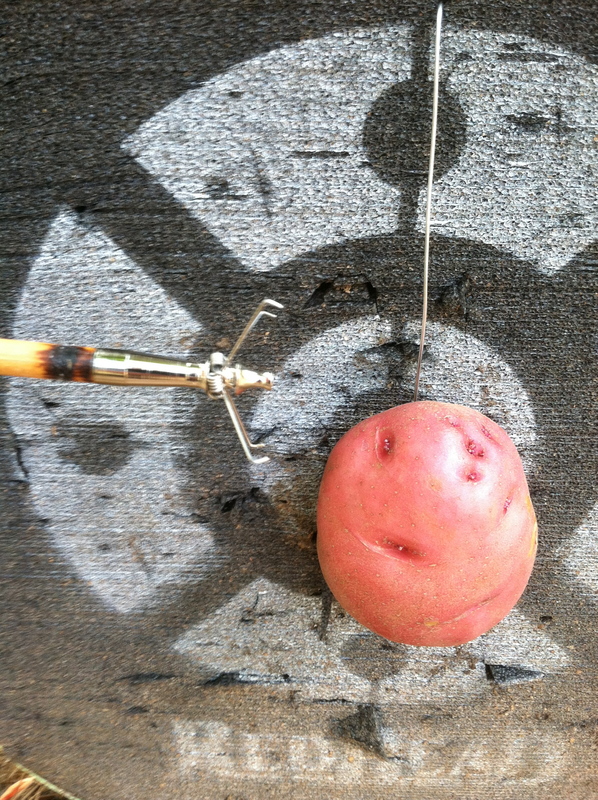 Dirt Road Girl offered up a sacrificial spud. The hunt was on! Use the same draw technique as you would with a traditional bow. 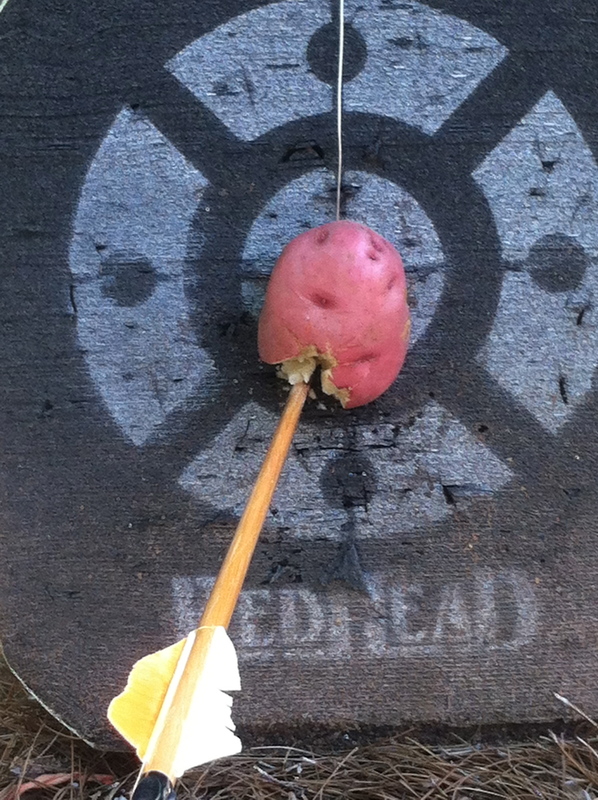 Dead spud at ten yards! Both field points and broadheads penetrated this target about 5 inches at ten and 15 yards. 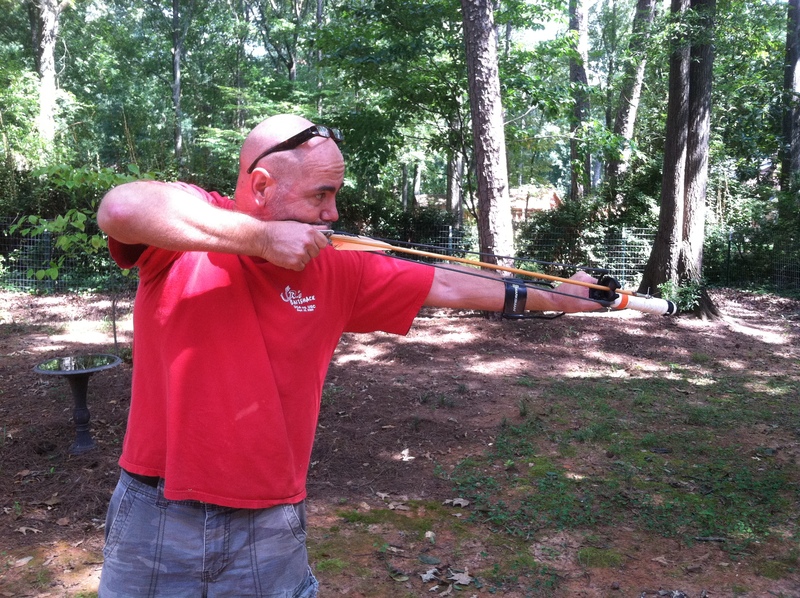 Just like finding your anchor point in archery, shooting sling shots are no different. I anchor at the right corner of my mouth and aim instinctively. Back when I built my pocket hunter, I secured a Whisper Biscuit between the arms of my sling shot with wire ties. I can fold the arrow rest down to shoot ball bearings or pebbles. My arrow with the fishing tip is carbon. I secured a piece of nylon bank line to the arrow. 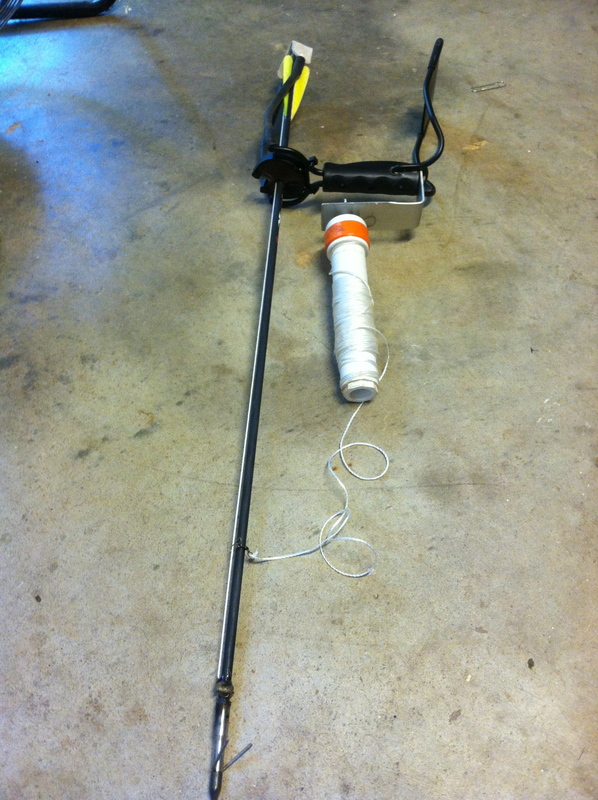 This line is attached to the line spool on the PVC pipe on the wrist rocket. I mounted the pipe on a piece of aluminum plate screwed into the base of the wrist rocket. When shot, the line peels off the spool perfectly. The main drawback of my pocket hunter is carrying full length arrows. Dave fixes that issue with take down arrows. You can check out his kit at his Pathfinder Store. The Three-Piece Take Down Arrows are sold separately. I’ve added them to my wish list. This allows you to carry a silent, but deadly, weapon in your survival kit – all in one self-contained bag. Brilliant! 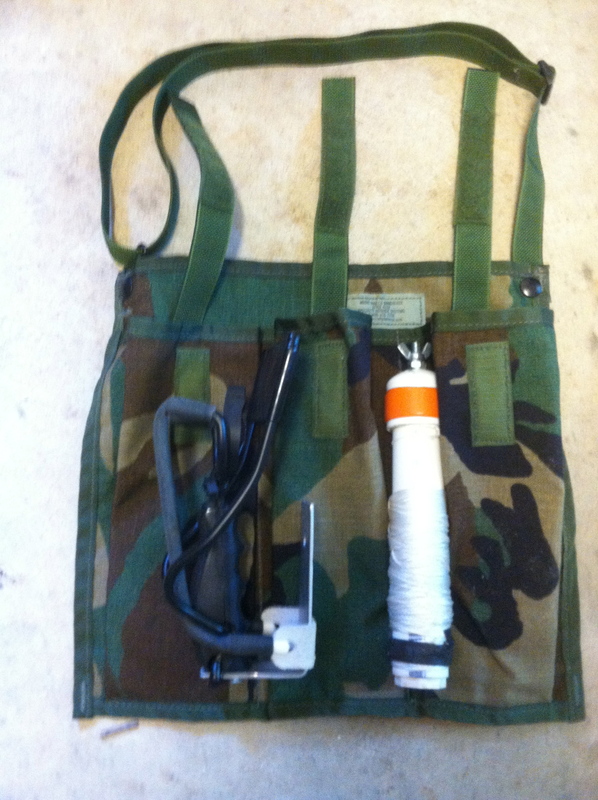 I use an old military surplus medic IV bag to store and carry my pocket hunter. Just need those break down arrows to complete the kit. As I said in the beginning of this article, I would prefer to have a long gun for wilderness survival. But the pocket hunter is another option for redundancy in harvesting game quietly in a survival scenario. Options are good! This past April I was contacted by Billie Nicholson of All American Sun Oven asking if I’d be interested in testing their solar appliance. It just so happens that my 8th graders were getting ready to study solar energy. Below are two tests I ran on the All American Sun Oven. First, school with hotdogs. Second, home with hot wings. The All American Sun Oven at my middle school. 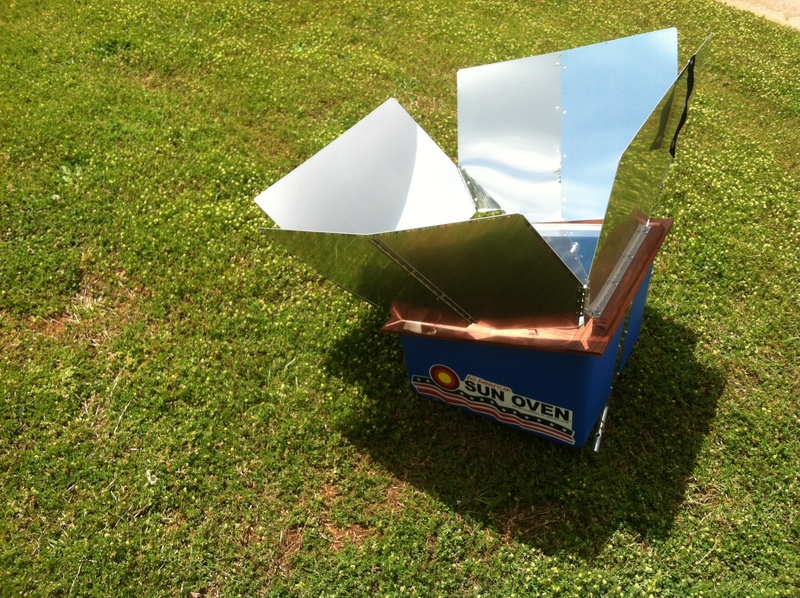 The Sun Oven arrived in the middle of a unit we were teaching on solar energy. Perfect! I was immediately impressed at its quality construction, simplicity, portability, and general idiot-proof-ness (the one-piece reflector was genius). The shipping box contained the basic get-started paperwork plus an instructional CD with hundreds of suggested recipes and advice. Being the frugal teacher I am, I talked my co-teacher into bringing the food for our first test. He brought hotdogs. Turns out he’s cheap frugal too. We set up just outside the classroom on a partly cloudy day. Focusing the oven to collect the most solar energy was easy. The Sun Oven has two alignment holes on the top of the oven to help you focus the sun’s energy for the best cooking temp. There is an adjustable alignment leg (self-contained in the unit) in the back to give the proper vertical angling of your cooker. Aligning the sun with the ‘focus’ holes on top and the up or down of the back leg, we were ready to cook in no time. For windy days, the cooker comes with two stakes to anchor the alignment leg to the ground. I placed the oven out around 30 minutes before our class began. [Note: Follow the Pre-cooking instructions before you cook your first meal. They recommend you place a container with three cups of vinegar in the oven, place cooker in the sun, and wait 90 to 120 minutes before cooking a meal.] This brought the temperature up to 250 degrees with the sun peaking in and out of the clouds. When the sun cooperated, the temp would reach 300 plus with no problem. We placed the cheap hotdogs in a Pyrex dish with a lid, set it on the Duel-Purpose Leveling Rack, shut the lid, and realigned the oven every 30 minutes. I was afraid that even a simple meal like hot dogs would not cook on a partly cloudy day. I was wrong. We cooked the meal for an hour and a half with sporadic sunshine. The hotdogs were too hot to eat as steam rushed around the Pyrex lid when we brought the dish inside. Most of the students were really impressed – as impressed as microwavable middle schoolers can be at the end of a school year. The performance task for the solar energy unit was to build their own solar cooker. We had some creative and interesting units built. 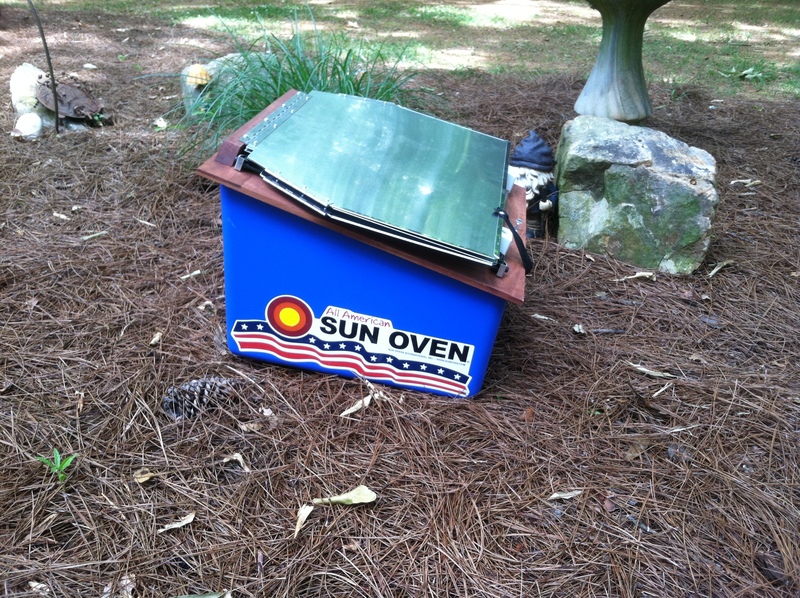 Below is one I was particularly proud of that was modeled after the All American Sun Oven. It turned a chocolate candy bar into mush. That’s all they brought to cook. 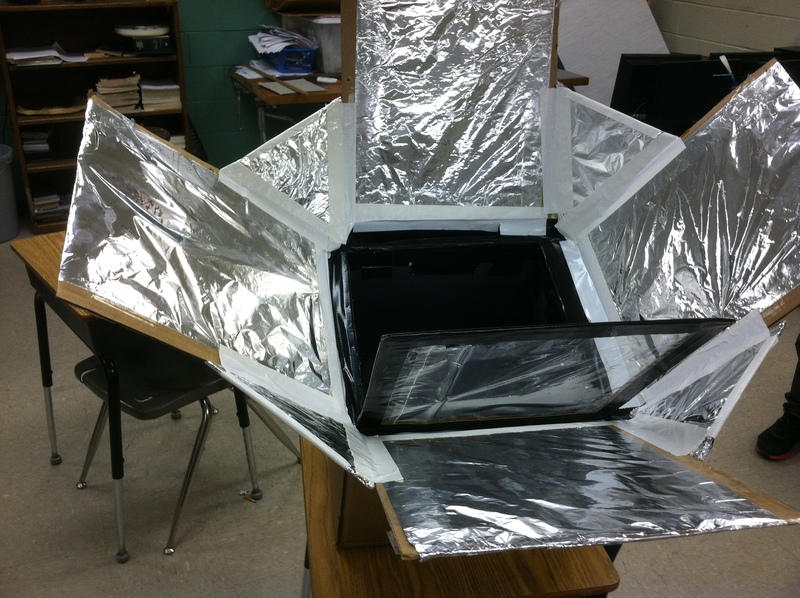 Student built solar cooker modeled after the All American Sun Oven. They used a milk crate, cardboard boxes, aluminum foil, plastic film, shredded paper for insulation, and duct tape (an essential for any good DiY project). 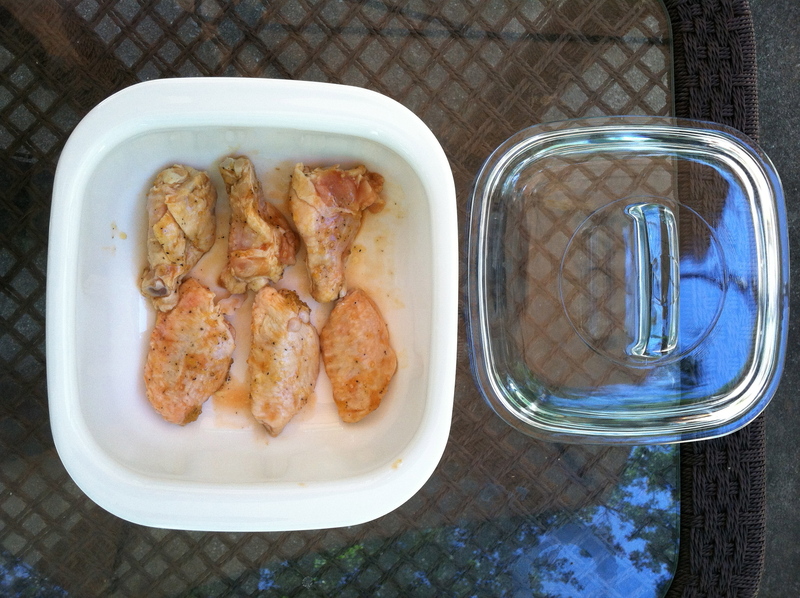 To test the Sun Oven at home, I prepared my chicken wings as I do anytime I grill hot wings. They marinate 24 hours in the special sauce before going on the Big Green Egg. I pulled six wings out to cook in the Sun Oven. Sun Hot Wings ready to cook in a covered dish on the leveling rack. I focused the Sun Oven and left the wings to cook. The oven reached 315 degrees in my backyard. Tip: Find a spot that gets full sun for several hours so you don’t have to chase the sun with your oven. I had to move the oven three times to escape the shade cast by trees. As the Sun Oven worked its solar magic, I cooked the larger batch of wings on my BGE. Dirt Road Girl and I enjoyed the meal and washed the dishes when I remembered the Sun Hot Wings outside. One of the benefits of the All American Sun Oven is that your can’t burn your meal. The oven is designed to heat evenly and hold the moisture in the food. Good thing, because I forgot about my Sun Hot Wings. They’d been cooking for two hours. Here’s the thing I hate to admit. The Sun Hot Wings were better than my standardly amazing grilled hot wings! The only drawback to the Sun Oven wings was they didn’t have the grill marks. Other than that, they were ‘fall off the bone’ tender and full of juicy flavor. There’s so many uses for the Sun Oven. There’s many recipes on their website and even more on the CD that comes with the oven. From asparagus to turkey, if you can cook it in your conventional oven, you can bake, steam, or boil it on your Sun Oven. Even if the extent of your kitchen experience is ‘cooking’ a bowl of instant oatmeal, you’ll look like a real chef with the Sun Oven. Cleaned, closed, and ready for storage. The one con of the All American Sun Oven happens to be its most appealing feature – fueled by free sunshine. Without direct exposure to sun, you’ll have to use another method of cooking. However, free solar energy is the most plentiful and inexhaustible source of energy we have around. The Sun Oven has been used around the world to provide off-grid cooking alternatives to people in all kinds of situations. From feeding orphans in Uganda, to North American hunters who love moist venison, it gets the job done. One of my favorites place the Sun Oven has been used is by Sherpas at base camp on Mt. Everest. Not any deadwood there for a camp fire. I highly recommend one as an off-grid cooking alternative and long-term money saver if you have funds available. The basic model runs around $300. Their website offers more models and lots of other accessories you can check out here. I hate to send it back to the company. I may have to save my money and keep this one. I’d always considered building a DiY solar cooker. But I don’t think I could match the All American Sun Oven’s performance. If you’ve made an effective DiY solar cooker, please let us know how it worked. Maybe you could share it on a guest post here.